Never before have humans been faced with so much information and so many demands on our time. This is affecting all aspects of life and has led the World Health Organisation to warn of a mental health epidemic. This is affecting our home and family lives, our performance and potential at work, and our happiness and health as a country. Employers are increasingly responding to these challenges by investing in workplace wellness offerings to support staff to better understand their own wellness needs, to build resilience, to enhance organisational culture, and put appropriate support systems in place. The trailblazing team of Susan Quirke and Ruairí McKiernan provide a unique offering that has been proving popular with leading companies and organisations that are keen to do more in the area of workplace wellness. The award-winning duo have been working in partnership for over ten years. They have become major champions for wellbeing across society and their work has been highlighted across the national media. Together they have launched numerous national wellness campaigns, helped host the Dalai Lama's visit to Ireland, and built several different non-profit organisations in the wellbeing arena. They are increasingly sought-after speakers and workshop leaders that are guaranteed to engage and inspire. They recently launched the 'Road to Connection' initiative that sees them travel throughout Ireland offering a week-long series of talks, workshops and gatherings focused on the theme of connection at the personal and community level. Susan Quirke, otherwise known as Susie Q, is an award winning social entrepreneur for her work in the field of mental health, a musician and meditation teacher. Her music has been featured on RTE radio and internationally and her wellbeing advocacy work has been featured in the Irish Times and the Sunday Independent. Susan was involved in the founding teams behind the SpunOut.ie youth organisation and the Soar Foundation. In 2015, she co-founded the A Lust For Life mental health charity and helped lead it until recently. She is a recipient of a Social Entrepreneurs Ireland Award and was shortlisted for the Image Business Woman Social Entrepreneur award. A communications graduate and advisor to the One Giant Mind Academy in New York, Susan runs regular meditation classes and workshops as well as offering tailored individual and team coaching. She has led group meditation events at the Electric Picnic, Body&Soul and Wellfest festivals and is a popular public speaker who brings huge depth, innovation and authenticity to all she does. More information www.SusieQMusic.com. Ruairí McKiernan is an award-winning social innovator, campaigner, consultant, writer and speaker who was recently selected as one of the top 10 people leading social change in Ireland by global social entrepreneurs organisation Ashoka. He is a Fulbright scholar, a Presidential appointee to Ireland's Council of State and a recipient of numerous awards, including a Social Entrepreneurs Ireland award. Ruairí is a business graduate with almost 20 years’ experience in the areas of social innovation and community development. This includes his work as founder of the pioneering SpunOut.ie youth organisation, which he started at the age of 25 and led for eight years as CEO, raising millions of euro, building a nationwide team of staff and volunteers, and championing young people's wellbeing across society. He is also a founding board member of the Soar Foundation, a co-founder of the Uplift advocacy organisation, and co-founder of the Gaelic Voices For Change movement of inter-county GAA players. His chart-topping Love and Courage podcast features inspiration global voices for change and he is a regular contributor to the national media on health and social issues. 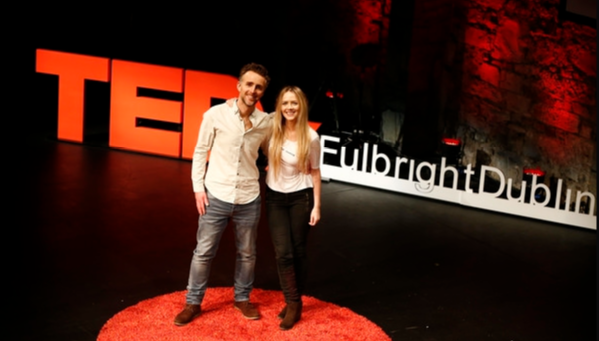 A powerful and passionate TEDx speaker, Ruairí reaches thousands each year through his talks and workshops in schools, colleges, workplaces and at conferences in Ireland and internationally. His work explores areas that include organisational culture, leadership, wellbeing, mental health, mindfulness and meditation, active citizenship and civic engagement, corporate social responsibility, and social innovation. He previously contributed a chapter on meditation to Sr. Stan's book 'Seasons of Hope' and his own book 'Hitching for Hope' will be published in 2019. More information www.ruairimckiernan.com.